This is the translation of the Latin Chant, Ecca lignum crucis ( Behold the Wood of Cross), for the veneration of the Cross on Good Friday. As in Latin tradition, the chant is sung three times, each time in a higher pitch register, However the roles are differently distributed. In the Latin rite the celebrant sings the first two of the three phrases, and the congregationsings the third ('come lets worship'). In the Syriac rite tht celebrant, the congregation, and the deacon sing each phrase consecutively. 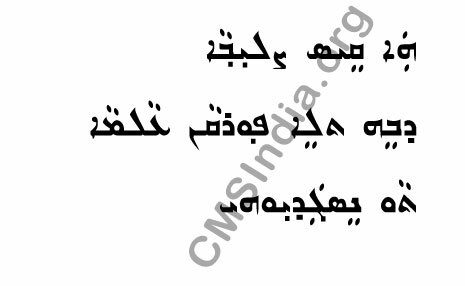 The Syriac chant has the same melody for all three phrases, unlike its latin counterpart. Had min īrē th’īn wā āţā d'yaw lē kasyā. W'maţmah wā bā l’en ruhānē w'pagrānāyē. Had ruhānā wā izgandā b’subār bathnē. By it he was stupefying the angels and men. And on the day of his birth many descended and sang praises.